One could spend a week drawing the interesting aspects of Fremont. Here is one of my favorites, the triangular space at the center of the universe, anchored by the Lenin statue. Lenin may have said, "No amount of political freedom will satisfy the hungry masses." I'd say, "No amount of Frank's sketches will satisfy my hunger for more!" In the hands of an artist even history's painful lessons yield beauty and light! Thank you. Great Composition and I love the depth of contrast in the statue. Great sketch and thanks again for the education on fountain pens and line weight. 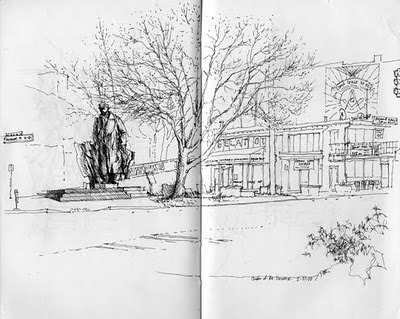 Fremont is indeed a sketching heaven! love the sketch Frank!